Mos Def was taken into custody and charged with disorderly conduct Thursday night after an unauthorized performance outside Radio City Music Hall during the Video Music Awards, police confirmed to MTV News. According to authorities, the rapper pulled up in front of the venue in a flatbed truck around 10 p.m. for an impromptu show for the audience gathered outside. 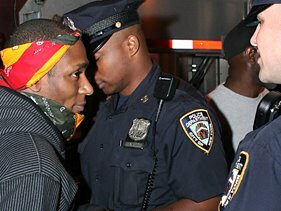 An NYPD spokesperson said officers asked Mos Def and members of his entourage to shut down their operation due to crowd conditions and the overall safety of everyone involved. It wasn't clear whether Mos Def (real name: Dante Smith) ignored or refused the orders, the police spokesperson continued. Sources close to the rapper said Mos Def was performing "Katrina Clap," a freestyle indictment of the Bush administration's slow response to last year's hurricane victims in New Orleans. After Mos Def arrived at Radio City Music Hall with his team in tow, the source said, officers on the scene approached the truck inquiring about a permit. When police were told a permit was in possession, officers let the one-song performance continue. The source said additional officers then approached the rapper demanding the operation be shut down immediately. The order wasn't communicated to Mos Def immediately, so the rapper didn't end his performance right away, the source said. Police then began to arrest members of the rapper's entourage, including his brother, according to the source. It was unclear whether or not a permit was granted. Mos Def's publicist called the New York Police Department's treatment of the rapper excessive. "Mos Def was unjustly arrested tonight while performing on a flatbed track in New York City outside the Video Music Awards," said Carleen Donovan. "Mos Def was not out to break any laws. His only goal was to heighten the awareness of a serious situation that still exists in our country. He does not want people to forget that although it's one year later, the people and cities hit by the hurricane still need the help of the American people." Members of Mos Def's camp say they have the entire ordeal on tape and will publish the video, possibly on a Web site, to shed light on their side of the confrontation. Mos Def was released early Friday morning (September 1).